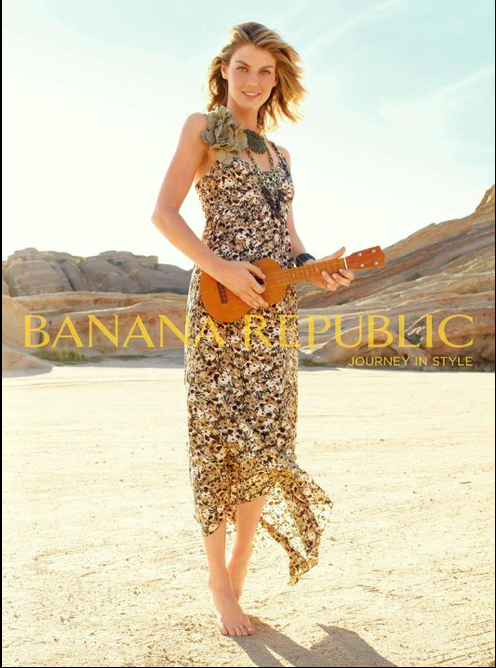 "...you can see a lovely new Banana Republic ad featuring a uke and a common companion - a beautiful girl." The Ukulelia Research Department was immediately on the job, turning up the higher resolution image displayed here. (Observant readers will note that the model was captured while playing the modern ukulele classic Elephant Town.) Research was also able to locate this video from the BR campaign. The video contains only fleeting images of the elusive uke, but enjoy the scenery, nonetheless. She wins the tallest uke player of the year award. I think she's about 8'7" tall. Anyone recognize the location of the photo shoot and video?